It has been a long slow task, but one that hopefully will yield good results. 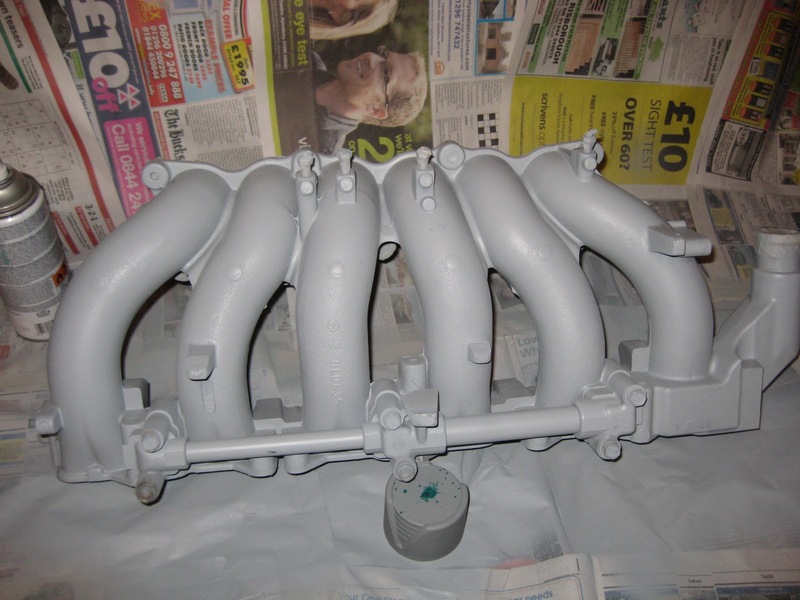 It is my plan to replace the lower inlet manifold with a painted one, the original idea of chroming being shelved early on in proceedings in favour of painting. I actually made it quite a big job for myself by not only removing casting lines but additionally polishing the whole of the units visible faces for when fitted to the car. 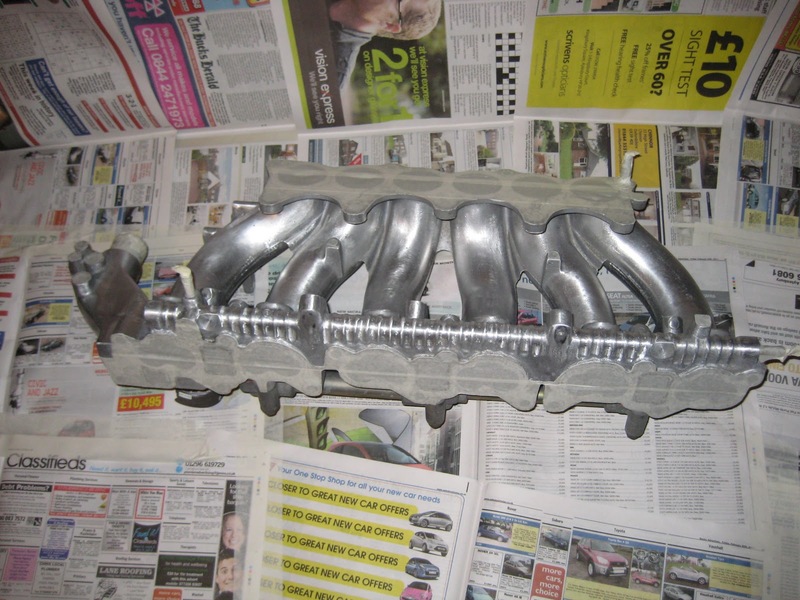 Polishing aluminium can be a boring task and with the rough sand cast faces of the manifold I found that a coarse 120 grit wet and dry paper was the ideal for initial smoothing. Naturally on an item with so many facets as this, it is very difficult to get into all nooks and crannies. 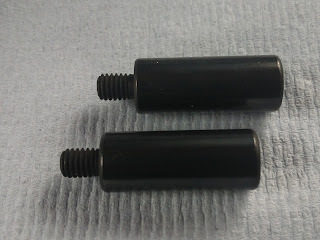 So I also used some small head grinding stones, it's not ideal using these as you may cut too deeply, creating more of a blemish that that which you were trying to remove. In primer, back face with top polished and lower rough cast. When the manifold was ready for paint, it was given a good wash. I used a jet washer at close rage in all the awkward areas to make sure that they were 'really' clean. Although a high powered water jet into a small area does involve an amount of 'splash back' so I had my bath for the week! 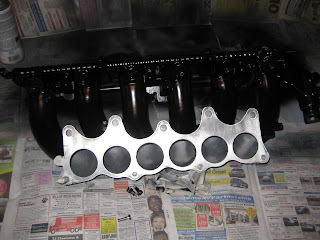 When the manifold was finally clean it had to be masked. There are so many holes and threads it took around one and a half hours to do properly. It seemed every time I turned the unit, I would find another hole wanting my attention. Lastly at the end of the process I noticed that the manifold I am working on has slightly different fixings to the one that is actually fitted to the car. However after closer examination it would appear that the unit will fit and the extra fittings are for fuel rail location only. To keep things simple I went with a paint finish of satin black. The main pipes that will be 'seen' have a high smooth finish. Whereas the rear pipes are 'half' finished, with the lower unseen portion remaining rough cast.